After the encouragement that could be taken despite defeat on their previous two outings at Dover and Salisbury City, this was very much back to square one so far as Eastleigh’s away form is concerned. An afternoon that hit its heights for the visitors when Jai Reason scored an early penalty which owed its award to a generous refereeing decision, ended with the Spitfires sitting just one place above the bottom of the Conference South. That is the stark situation facing a side which has now endured a run of five successive league defeats, and after a display which was largely lacking in any guile, purpose, or penetration. It had all started so brightly. With just three minutes on the clock, Richard Pacquette flicked a throw on the Eastleigh right into Glen Southam, who found Damian Scannell inside the home area. Scannell checked sharply outside his marker and went to ground. The referee saw enough to point to the spot, from where Reason nervelessly smashed the ball high into the roof of the net. Prior to that opening goal there had been little action, other than a hopeful Bromley forward ball which Andy Forbes was caught beneath. Adam Everitt was sharp on the cover however, and was fouled as he snuffed out the danger. Forbes was returning to the team, as Richard Hill sprung a surprise by making four changes to the eleven which started at Salisbury. Osei Sankofa returned at right-back, with Mitchell Nelson partnering Forbes in the middle. Mark Hughes was deployed alongside Southam after missing the game in Wiltshire through suspension, while Lee Peacock was preferred to Craig McAllister in attack. The visiting bench would have made for some five-a-side team, containing as it did; Jack Dovey, Tom Jordan, Michael Green, the remarkably unlucky to be left out Leigh Mills, and McAllister. 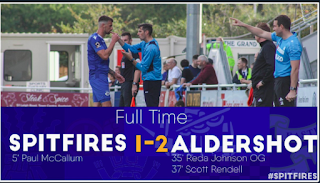 After making such a positive start to the game, there was no hint of the disappointment to come as Eastleigh looked the more confident of the two sides, playing at an incredibly high-intensity, and displaying an admirable appetite for hard work. The visitors’ commitment was exhibited when Scannell was penalised for a slightly mis-timed challenge as he tracked back, quickly after winning a similar duel in a deep position. Forbes was typically keen to move out and anticipate play, something that served him well as the afternoon progressed, but for a second time in the opening stages he left space behind him, allowing Elliot Buchanan to run onto a threaded Tony Finn pass. Nelson read the situation to step across and thwart Buchanan. As the quarter-hour mark approached, Ali Fuseini, the home captain and a man whose infamous Eastleigh career spanned one appearance, broke forward for the first time onto another Finn pass. The ex-Millwall player’s run was halted by a characteristically tough Everitt tackle. Still, the away side remained the more cohesive unit, and they came agonisingly close to doubling their lead on fifteen minutes. Scannell and Pacquette combined to play a ball back to Reason, who in turn fed possession forward to Southam. From just inside 18 yards on the right, the Spitfires skipper drilled a fierce shot which flew marginally past Joe Welch’s left-post. The impatient and anxious home fans, already concerned by their own team’s lowly league position – they started the match occupying the final relegation place – were growing agitated and vocal in their criticism. Their frustration was exacerbated as the Ravens struggled to find any space, best exemplified around the twenty minute mark when a spell of Bromley possession ended with right-back Sanchez Ming being forced by incessant Eastleigh closing down to hack the ball all the way through to Ross Flitney in the visiting goal. Unfortunately, it wasn’t long before the Spitfires started to invite pressure onto themselves with some careless play, and in doing so offer a glimmer of hope to a team which was clearly lacking in confidence. Nelson conceded a free-kick on halfway for a challenge which could have earned him a booking – the defender is currently leading something of a charmed life when it comes to avoiding the referee’s notebook. Everitt again was alive to the threat as the set-piece made its way to the back post, and scurried sharply in front of an onrushing white shirt to clear with his right-boot. Within a minute, Nelson miscued a clearance high into the air which dropped for Louie Theophanous. Fortunately, the forward’s weak first time volleyed effort was easily dealt with by Flitney. The home side were starting to sense a way back into the game and it duly came on 27 minutes. Finn, who was lively and incisive all afternoon, worked some room for himself on the right, managing to evade Everitt and clip a ball into the area. Fuseini met the cross with a header which struck the bar. Unforgivably, the Bromley man was able to pick up the rebound and, under minimal pressure, strike a right-foot shot across Flitney and inside the far post. The equaliser unsettled the Spitfires, and within sixty seconds Nelson’s back-header towards his ‘keeper was short and perilously close to setting Buchanan free on the visiting goal. Fortunately, a switched-on Flitney raced from his box to clear just ahead of the forward. It was another five minutes before Eastleigh constructed any type of flowing move. Everitt played a ball ahead of him to Reason, who had drifted off the left-touchline in an attempt to increase his impact on proceedings. The talented number 10 cleverly applied the deftest of touches to clip a pass in behind him to Pacquette, before turning to receive the return and hit a shot which was blocked. That cameo was a reminder of how influential Reason is when he is employed in a central role. At Salisbury, and here today, the utilisation of the team’s creative hub on either wing has been a waste. With half-time approaching the Spitfires did generate further openings. The first arrived after Southam was fouled as he attempted a shot on the edge of the home area – after further good link play between Reason and Pacquette. Everitt’s free-kick, however, was struck into the wall. Five minutes before the break, Scannell, now operating on the left having switched flanks with Reason, did well to jink between Ming and Finn in a tight area by the touchline, before his attempted cross was put behind for a corner. Reason’s initial delivery was comfortably cleared, but when Everitt collected possession on the left he hit a fine, deep cross which Forbes raced onto at the back-post, his header ending up in the side-netting. Regardless of Eastleigh’s brief flurry late in the half, the feeling going in for the interval was that the hosts had shown enough to warrant parity. Nevertheless, there would be reason for optimism if the Spitfires could return after the interval and start with similar intensity to that with which they opened the game. Sadly, the reality proved to be vastly different. The second period was only a minute old when Bromley’s spritely left-back, Marlon Patterson, carried the ball forward and played a pass inside before continuing his run which wasn’t tracked by the ball-watching Scannell. Patterson took the return pass before supplying an excellent cross which Pierre Joseph-Dubois latched onto ahead of Flitney to turn home. The afternoon’s third goal visibly sucked the life out of the Spitfires. 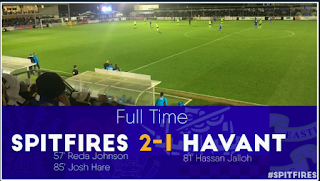 Recently the team have been deserving of a great deal of credit for their fight, resilience, and refusal to lie down, but at Hayes Lane none of those attributes were on display as Bromley were able to swagger to three vital points. The value of that maximum return in a tight league is highlighted by the Ravens ending the day four places higher than they started. Minutes after Dubois’ strike, Eastleigh did fleetingly threaten when a Flitney throw picked out Reason on the left. The playmaker’s square ball offered Pacquette a chance to shoot but the forward, returning to the home of his most recent employer, saw his shot easily stopped by Welch. The ease with which Bromley were now able to attack was exhibited when Buchanan’s loose touch in the middle was picked up by Joseph-Dubois. The winger was able to run unchallenged diagonally, and then allowed time to lift his head and measure a pass out to his right. Everitt did well to block the shot behind but the reprieve was short-lived. The subsequent corner was floated over from the right where the ball reached Moses Swaibu, completely alone in a central position fractionally inside the area. The towering centre-half nodded forward where Theophanous, similarly free to do as he wished, controlled, turned and put the ball gleefully past Flitney and into the net. It was as poor a goal as the Spitfires have conceded this season. Soon after that strike, Eastleigh shouts for a second penalty were waved away. In truth, the appeal did look soft after Reason collected a Sankofa pass on the right and spun inside into the box before looking to go down when he felt contact. With Bromley taking control, the Spitfires used the opportunity of a stoppage in play to treat a home injury to gather every single outfield player together for a pep-talk. That ad-hoc meeting was quickly followed by McAllister and Mills being introduced into the action, with Pacquette and Sankofa the players to make way. Mills took up a position alongside Forbes, with Nelson moving out to right-back. There was to be no inspiration from any of these developments, with the next incident of note being a fantastic lofted pass by Fuseini which released the increasingly menacing Joseph-Dubois on the left. Flitney did well to come out and block with his feet from the advancing winger. Any fluent Eastleigh passing was becoming increasingly rare, and all too often we suffered the sight which was so common on away trips earlier this term of a Spitfires goalkeeper thumping the ball long in the hope that a target-man would be able to make something of the rudimentary service. Not surprisingly, the most common outcome was the opposition regaining possession. One fluid move did see Forbes, McAllister, and Everitt combine to supply Reason, but from his position on the left the ex-Braintree man was forced wide and the ball ran harmlessly behind. Reason’s irritation will only have ratcheted upwards a minute later when he managed to evade three snapping home bodies in the middle, only to be greeted by a fourth white shirt to swipe the ball away with the Eastleigh player seeking a passing option. In a rare comic moment, an unfortunate slip by Finn resulted in him slicing a free-kick on the right horribly behind. The set-piece was gained after Everitt was late into the tackle on Ming. That lapse aside, the left-back’s tigerish tackling and wholehearted display was a standout effort among the visiting team. Everitt hasn’t enjoyed the easiest return to the Silverlake, but starting the last three matches he has been one of his team’s brightest sparks. With just over 15 minutes remaining, Peacock had his first effort on goal after intercepting a Southam shot inside the area. A good touch brought the ball under control but the forward’s left-foot effort was dragged past the near post. The visitors’ best chance to gain a foothold back in the match came when Nelson did well to send a cross over from the right after a brief period of ball retention by the Spitfires. The right-back’s deep delivery was met by the head of Forbes, who had stayed up after a recent set-piece. As the ball drifted towards goal, Ravens’ centre-half Liam Harwood dashed across and scrambled away from in front of the goal-line. Richard Hill’s final attempt to alter events came with little over ten minutes remaining when Jordan replaced Hughes. The switch enabled Forbes to take up a striking role, with Jordan slotting in alongside Mills. In fact, the change was a catalyst for some of the more confused and incohesive football produced by an Eastleigh team for a long time. The re-jigged system had allowed Reason to move into a central position, but in tandem with the equally tireless and motivated Southam, he was forced to watch a succession of balls struck over his head towards what had become a front four. Peacock was drifting wide, seeking to take advantage of his height against the diminutive Patterson, and provide Scannell and, chiefly, Forbes with service to run onto. In fact, Bromley’s back-four and midfield were easily picking up second-balls and able to defuse any pressure by keeping hold of possession, sensibly exploiting the gaping holes in the midfield areas. 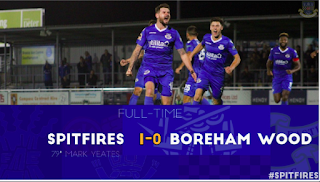 The Spitfires didn’t manage a strike on target in the latter stages, instead finding themselves stretched and working to keep the score down. When Reason illegally halted another direct run by Joseph-Dubois, Danny Waldren’s dead-ball hit the wall, before eventually being forced through to Joseph-Dubois whose sharp strike required Flitney to dive and push away. With minutes remaining a loose Jordan header fell to Aaron Rhule, and the youngster who in his short time on the pitch was bursting with raw promise, drove directly past Nelson and into the area where he fell too easily and saw his cry for a penalty ignored. After Joseph-Dubois had headed a Finn corner too high, Eastleigh finally conjured a chance to pose a problem at the other end when Peacock was pushed high on the left. In a moment that summed up the final period of the game, Reason’s set-piece floated harmlessly into the grateful arms of Welch. A further example of the home side’s greater sharpness and willingness late on, came after a corner from the left fell for Scannell to shoot. Before the wide-man had managed to get a strike away a defensive boot had reacted quicker and extinguished the opportunity. Ming was bizarrely booked during the additional four minutes for perceived time-wasting. Ironically, the decision was probably the afternoon’s biggest waste of time, with Bromley having no trouble seeing the match out. The hapless nature of the Spitfires’ latter efforts was encapsulated in the dying seconds, with Reason forced to defend deep and hack the ball clear into an area where the ideal player to collect possession would have been himself. It would be unfair to criticise any player for a lack of desire, and indeed many looked crestfallen as they left the field, none more so than the ultra-competitive Southam. As discussed after the New Year game at Salisbury, the team need to find an identity and definitive style of play. There is no choice now but to forget this afternoon – players and supporters alike. There is a crucial period of the season imminent with a host of points to compete for. We’re not in the happy position we hoped to be of focusing on the top end of the table, but for now a considerable effort is required to ensure there is to be no scrap at the bottom.